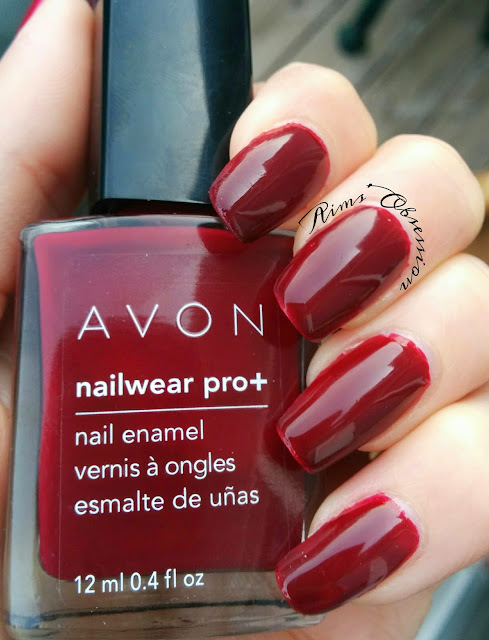 I met Jodi through a group on Facebook and when she mentioned that she had signed up to be an Avon Rep and was looking for some bloggers to do a review on Avon polish, I gave her my link. (The more I can share with you the better!!) She sent me two Avon polishes in the mail for an honest review. 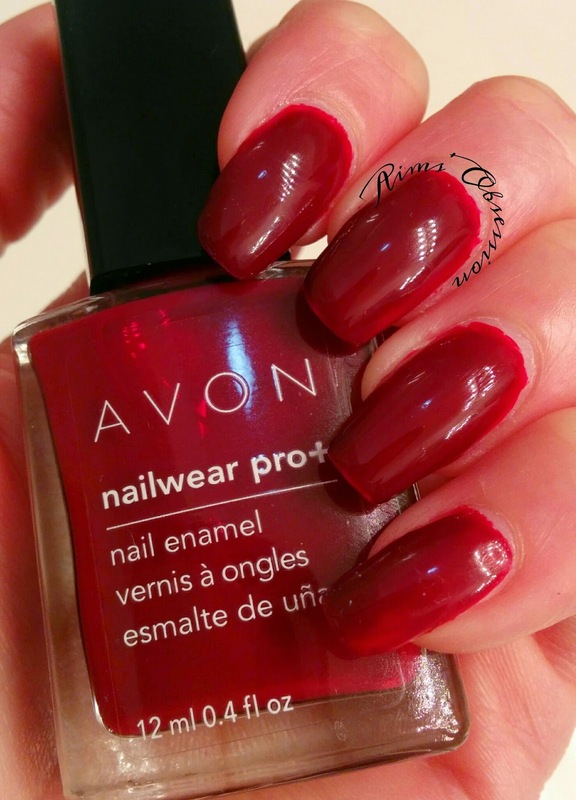 I was pleasantly surprised with the quality that Avon polishes had to offer. 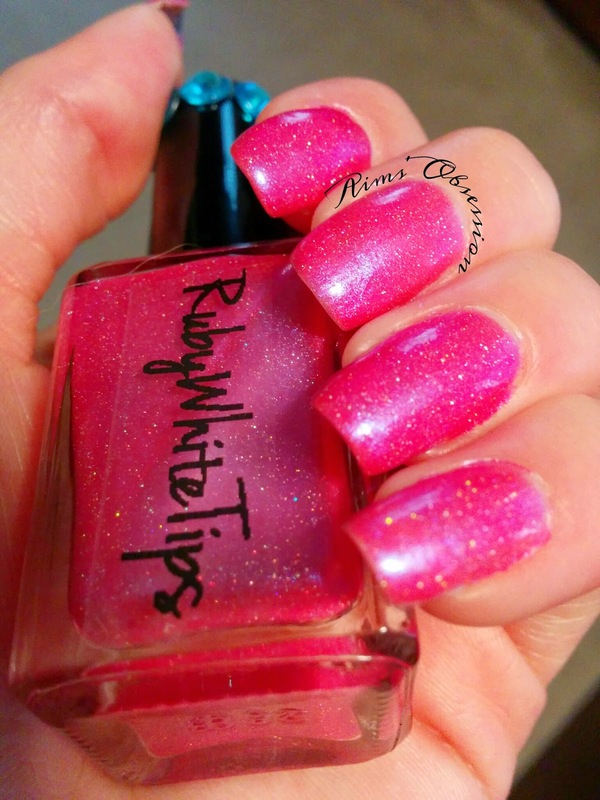 I've never tried the brand before now and figured with the cheaper prices that the polish would also be cheap quality. I stand corrected. Jodi sent me Cherry Jubilee and Gunmetal. 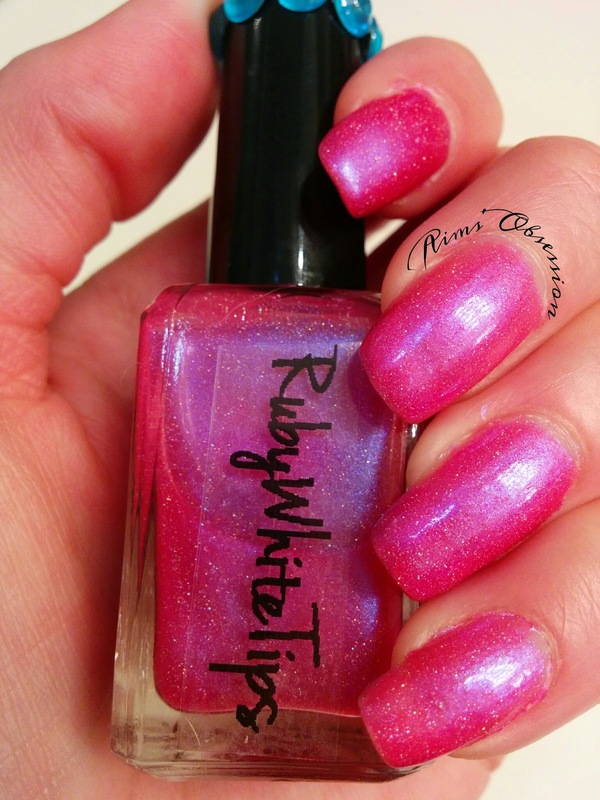 Cherry Jubilee applied very nicely. I was really surprised to see that I only needed 2 coats of polish to achieve this look. (One coat is pretty dark as well but I applied two coats to cover up my brush marks). Cherry Jubilee dried so fast on me that I had to double check the bottle. I thought it might have been the speed dry type. It's not. 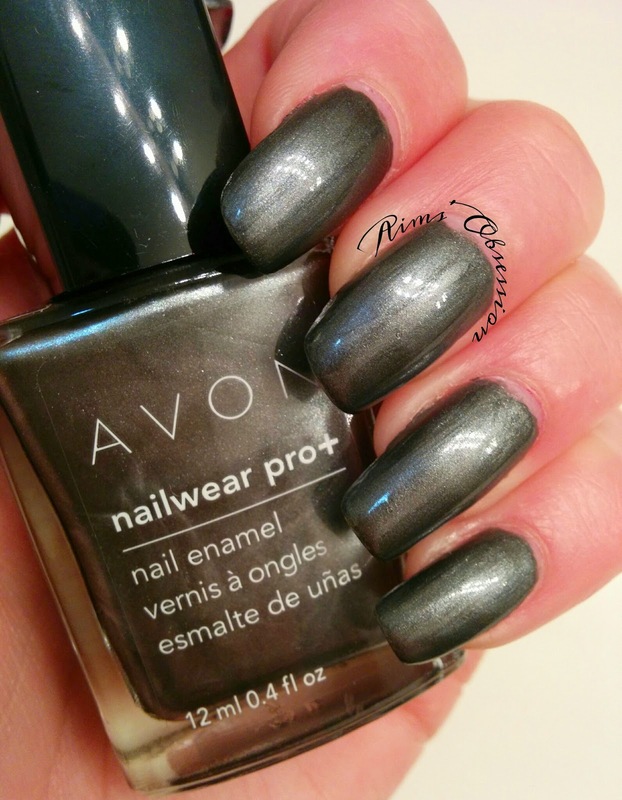 I'm really curious to see how fast the speed dry polishes by Avon dry. I'm not normally a red fan on my own nails. It tends to look silly on me. 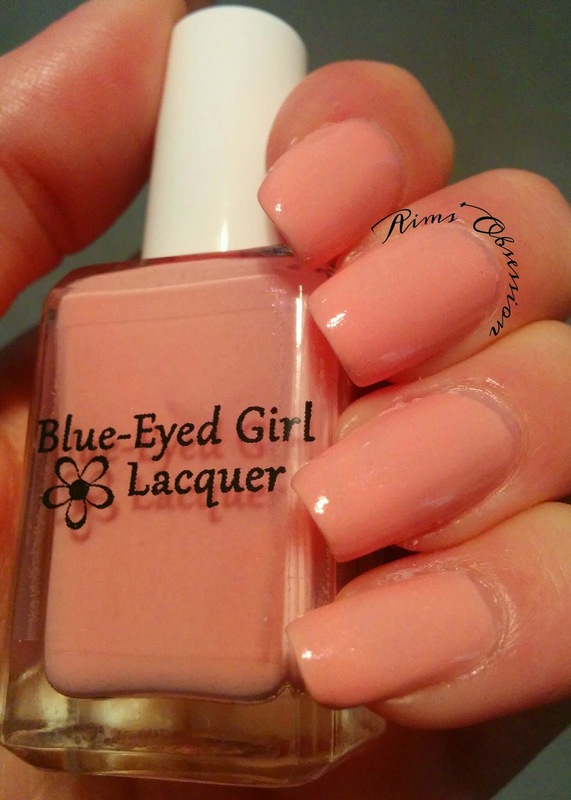 However, I fell in love with this shade. I'm thinking because it is more of a maroon. 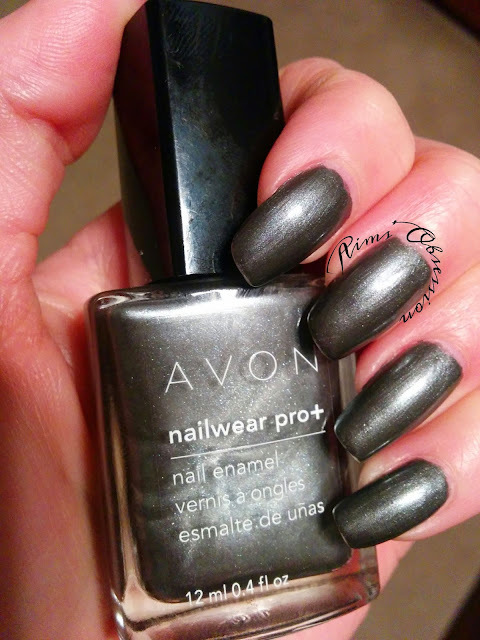 Gunmetal applied just as nice! Same dry speed. I am super impressed!! (2 coats again here). Both polishes are shown with topcoat but really did not need any since they have a high shine finish of their own! Here is a little bit of nail art for you! 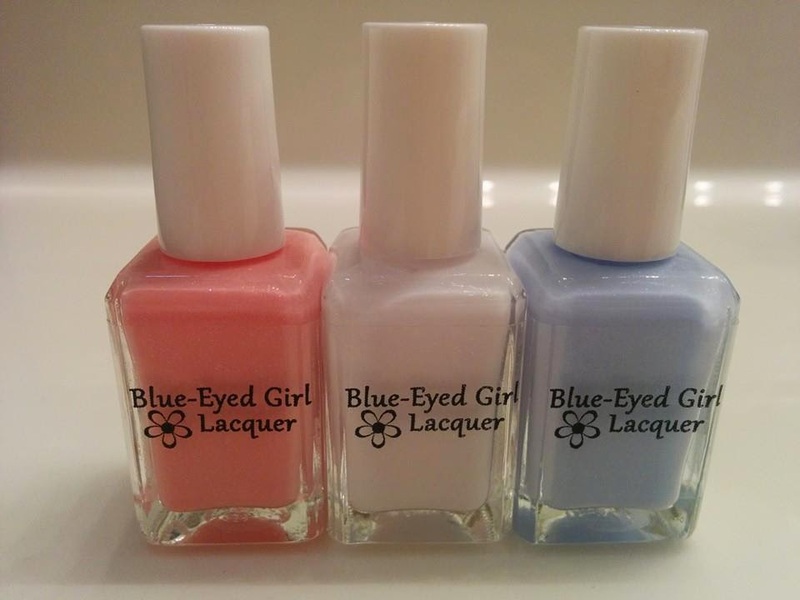 Tonight on the blog (as promised) I have 3 beautiful polishes sent for an honest review to me from Blue-Eyed Girl Lacquer. These three polishes are from her upcoming April Showers collection, set to release this Sunday April 27 at 3:30 pm EDT. You will not want to miss out on these beauties! 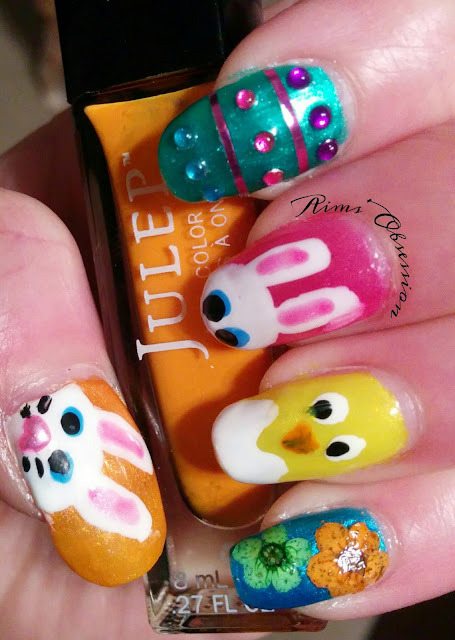 (Stock will be low but depending on popularity, Julie may bring them back for the May restock)! 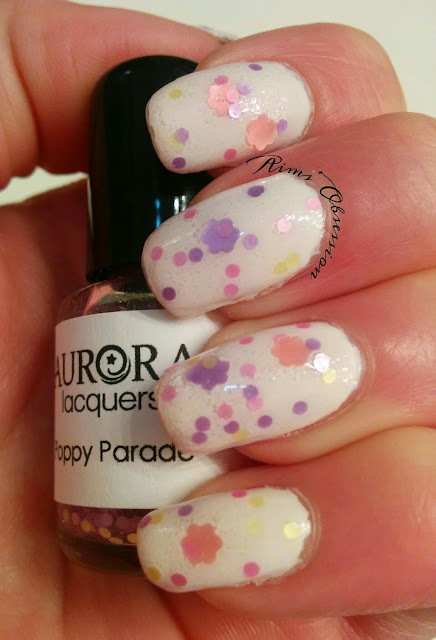 Dogwood – white crelly packed with silver shimmer, purple micro-flakies, and multicolored iridescent flakies. Peruvian Lily – pastel orange crème with a red to gold shift. Cherry Blossom – pastel pink crelly with a teal to purple shift. 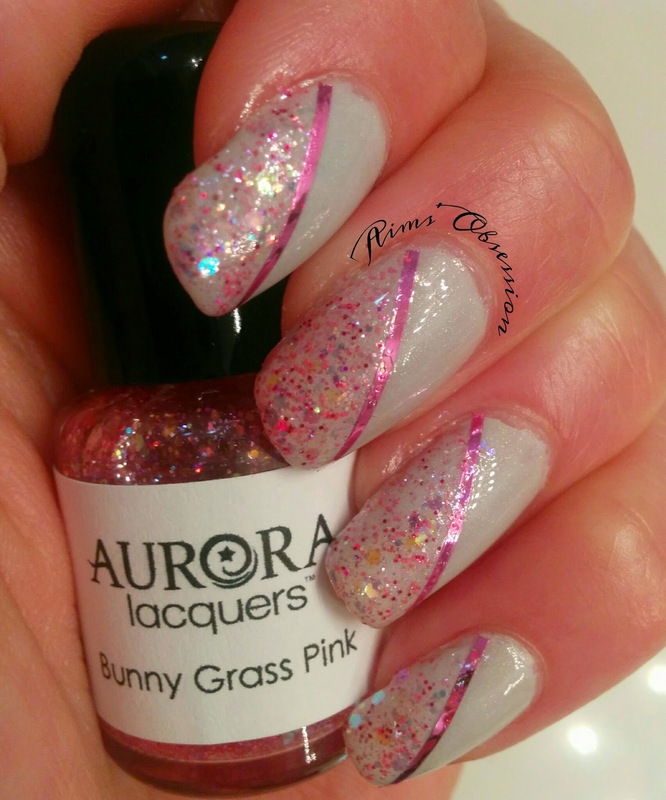 Purple Phlox – purple crème with blue to purple iridescent micro glitters. 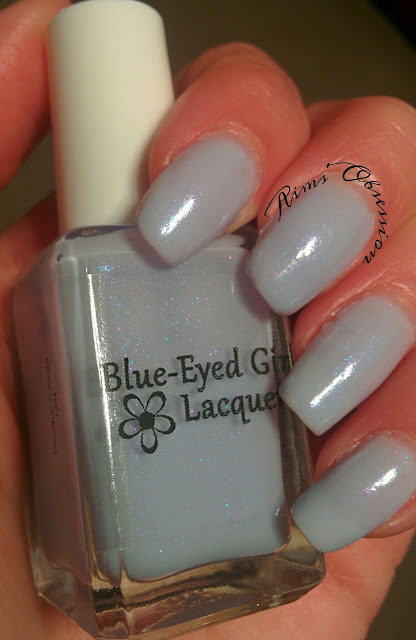 Lady Slipper – mint green crème with a blue to purple shift. 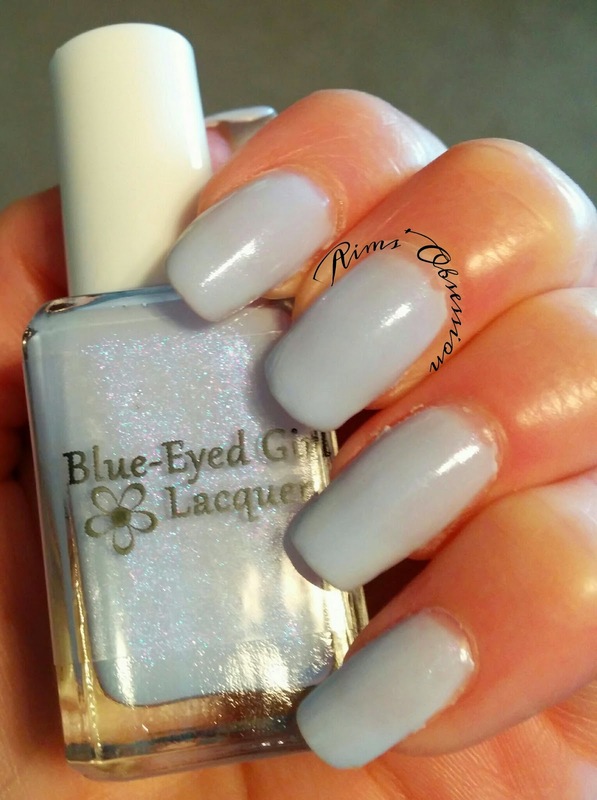 Hydrangea –pastel blue crème packed with purple, blue, and aqua shimmers. I was sent the following three: Peruvian Lily, Dogwood and Hydrangea. 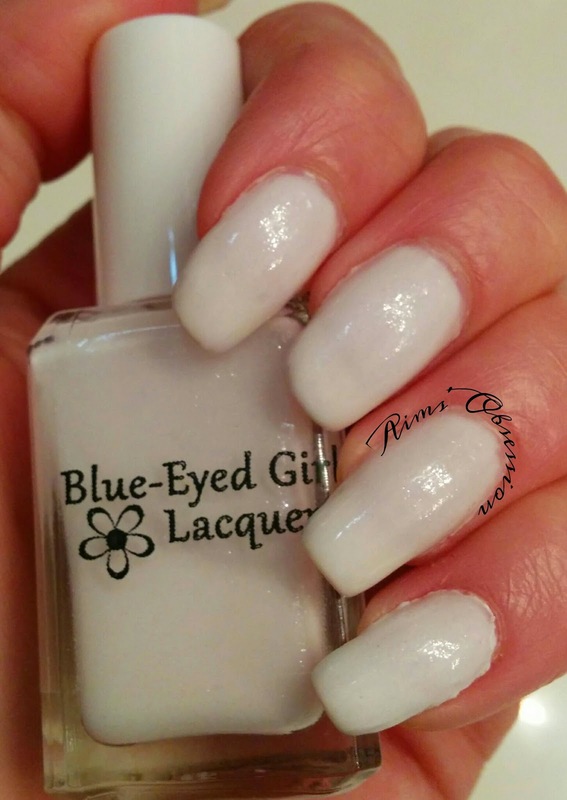 Blue-Eyed Girl Lacquer used the old saying "April Showers, Bring May Flowers," as an inspiration for this new line. 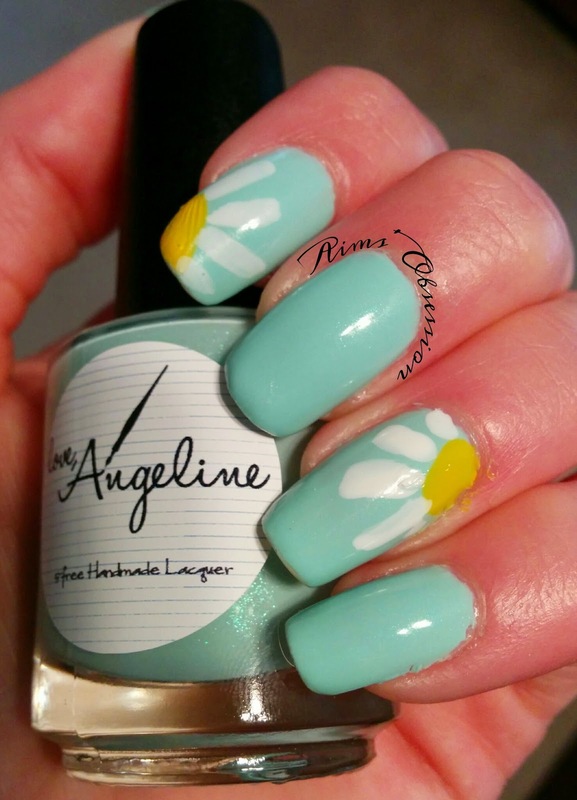 It is supposed to be an array of soft pastel floral colors with the look of dewy rain on them. I believe she hit it right on the dot! 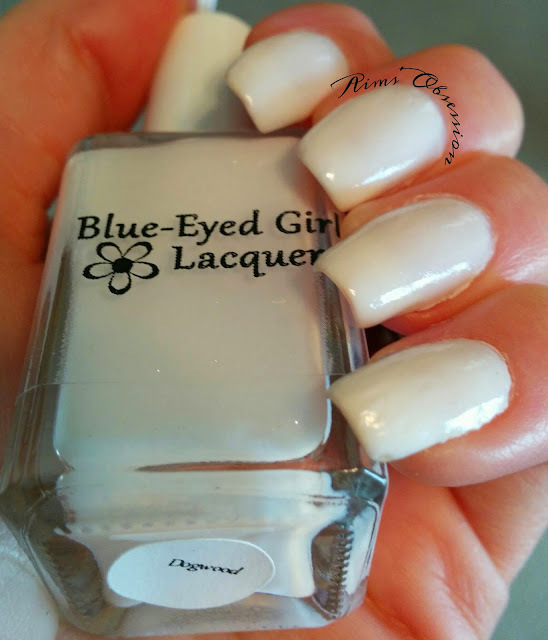 Peruvian Lily will be sold on the Blue-Eyed Girl Lacquer bigcartel site for $12 for a full size bottle. 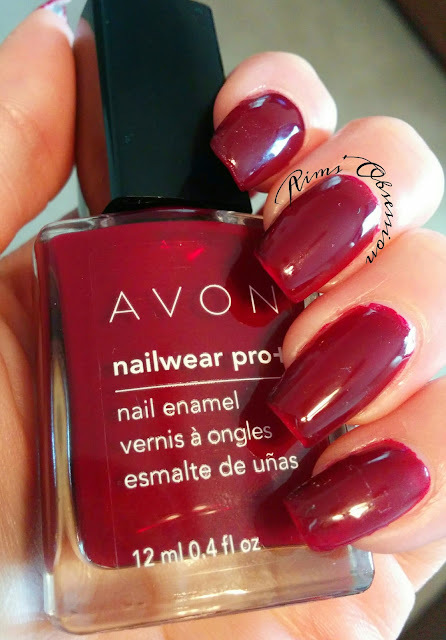 It is such a unique color and is definitely a must have for your collection! Dogwood is a white crelly polish packed with silver shimmer, purple micro-flakies, and multicolored iridescent flakies. 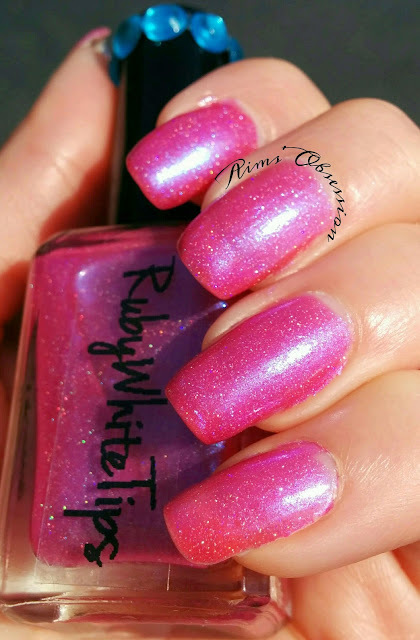 I'm not usually a fan of white polish and mostly save it for polish undies but I can see myself pulling this one out to wear again as just a plain (but shimmery!) mani. 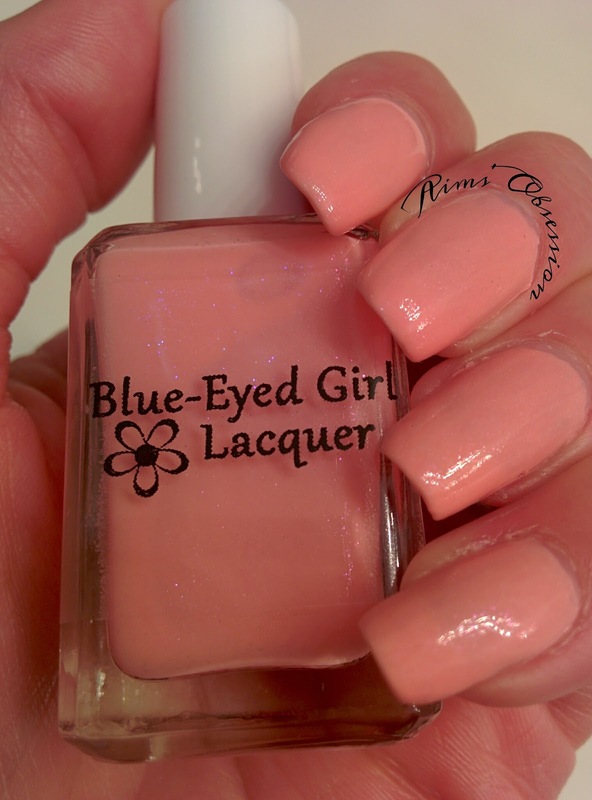 Dogwood will be available Sunday on the Blue-Eyed Girl Lacquer bigcartel site for only $8.50 for a full size bottle. 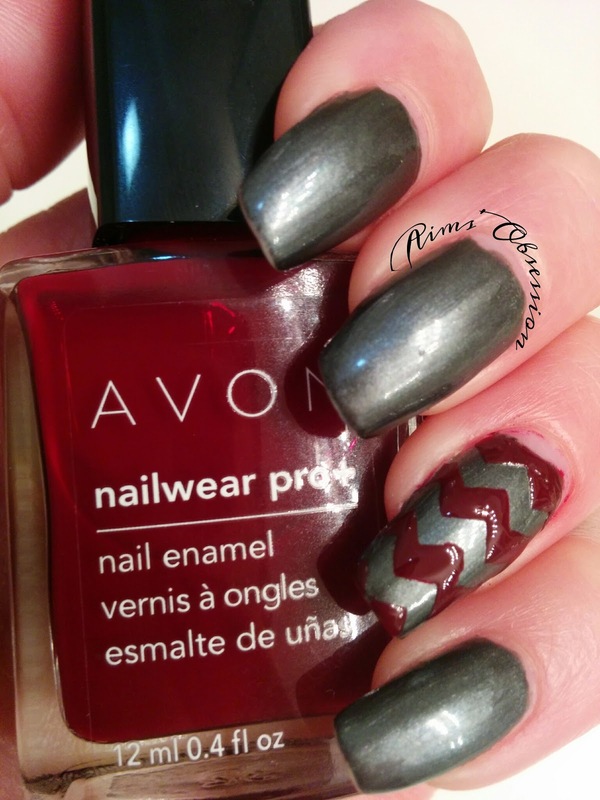 Worn as a mani, or as undies for nail art. . . this is a must have as well! 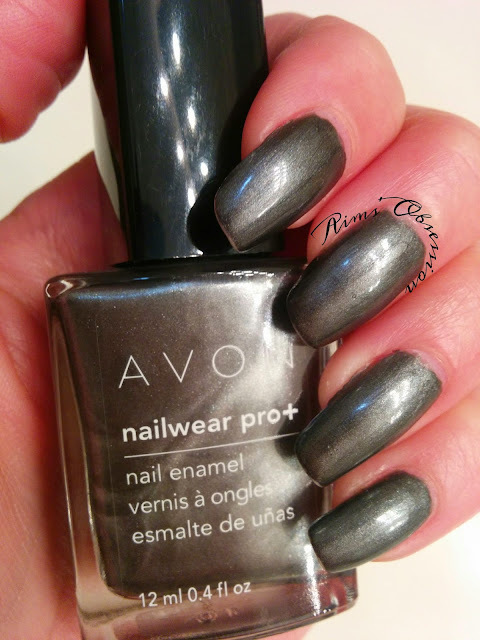 I achieved this look with 3 thin coats of polish and topped it off with topcoat. Holy cow! I am so glad I was able to catch the gorgeous shimmer in this picture! 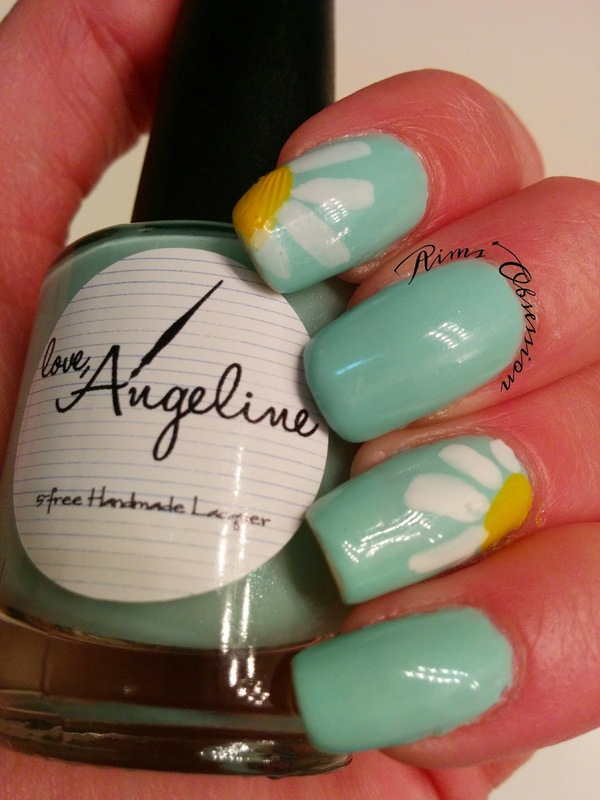 LOVE the formula and at only $8.50 for a full size bottle you should be running to her site on Sunday to buy this gorgeous baby blue! 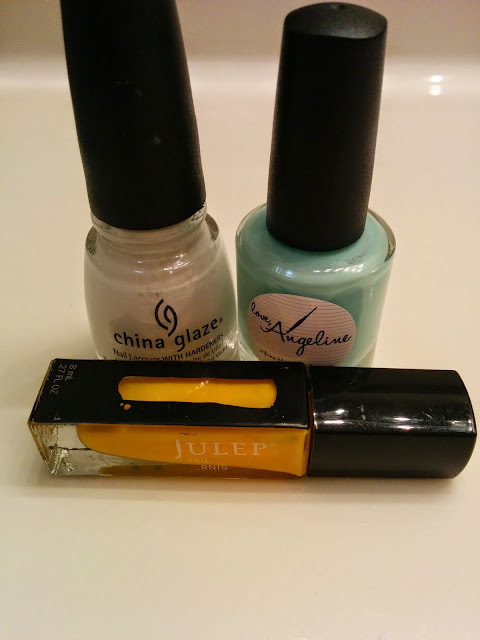 I was super impressed with all three polishes! A few of the older Core Line, Winter Collection, and Valentine’s Day Collection polishes will also be restocked during this sale, and they include Watch the Walls, Self Satisfied, Tacky Winter Sweater, Skating in the Snow, Idealistic Future, and the December Duo. Prices for these polishes will be reduced to $6 for each individual polish and $10 for the Duo. Please note, sadly, my cost of production has increased due to the rising prices of raw materials. As such, I have had to increase the cost of future collections. 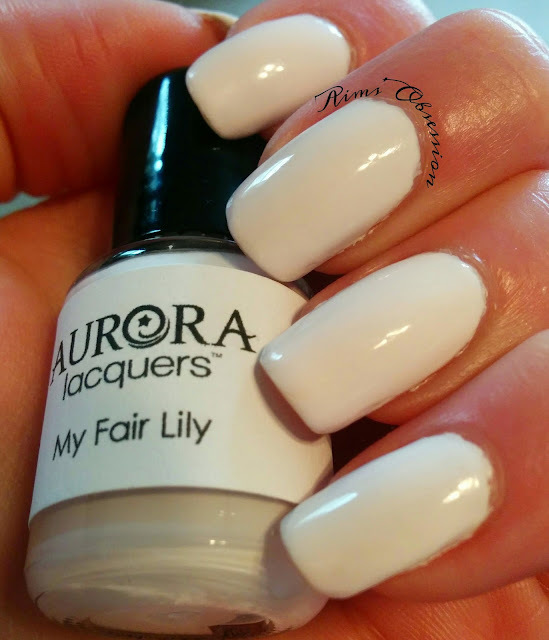 All old collection polishes will retain their old pricing. From here on out, the new pricing structure will be $8.50 for glitters/cremes/shimmers, $12 for shifters/duos/holos, and $13 for LEs. I appreciate your understanding! 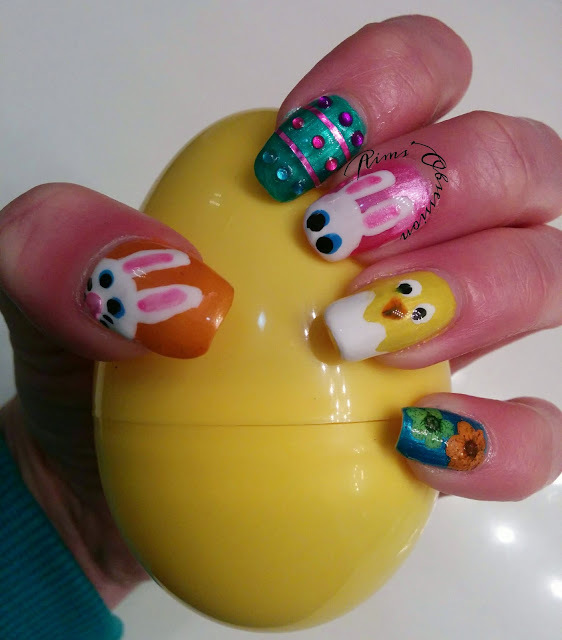 I'm part of two fabulous nail art groups on Facebook which challenge you to test your nail art skills. Both groups this week have chosen Spring themed challenges. Nail Art Designs theme this week is Easter nails and Challenge Your Nail Art's theme for today is Easter Egg nails. I did a mixture of both! I had a ton of fun with this challege! 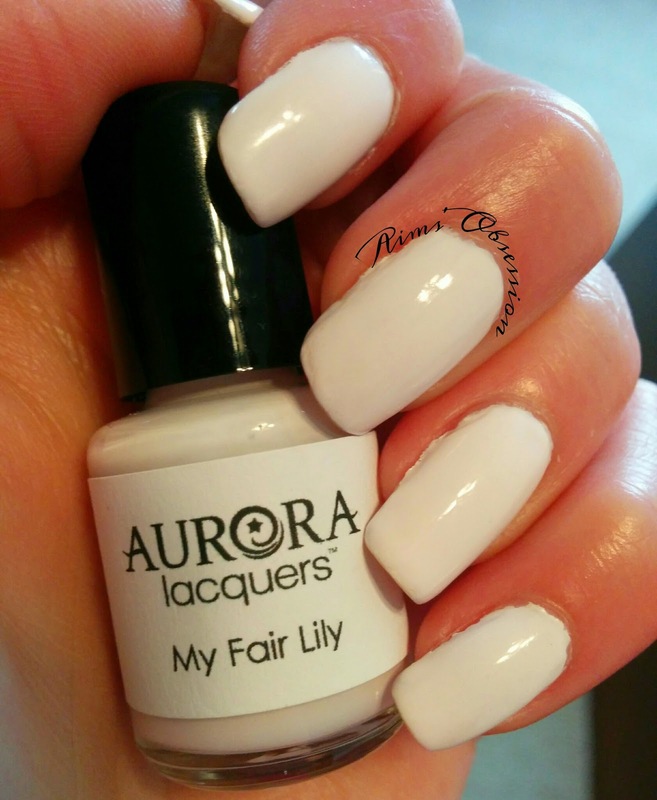 I am really excited to share a new indie polish brand with you today, Aurora Lacquers. 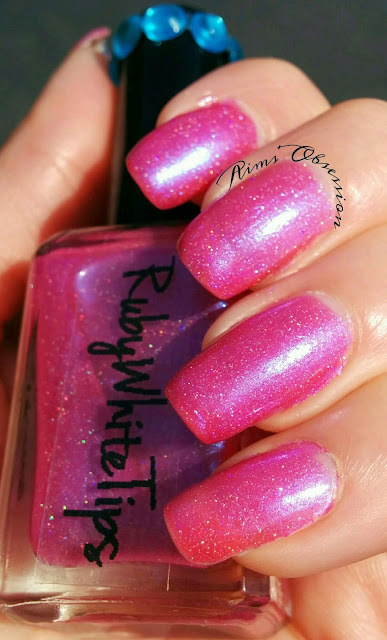 This mother/daughter combo sent me 4 of their new polishes to swatch and review/share with you! 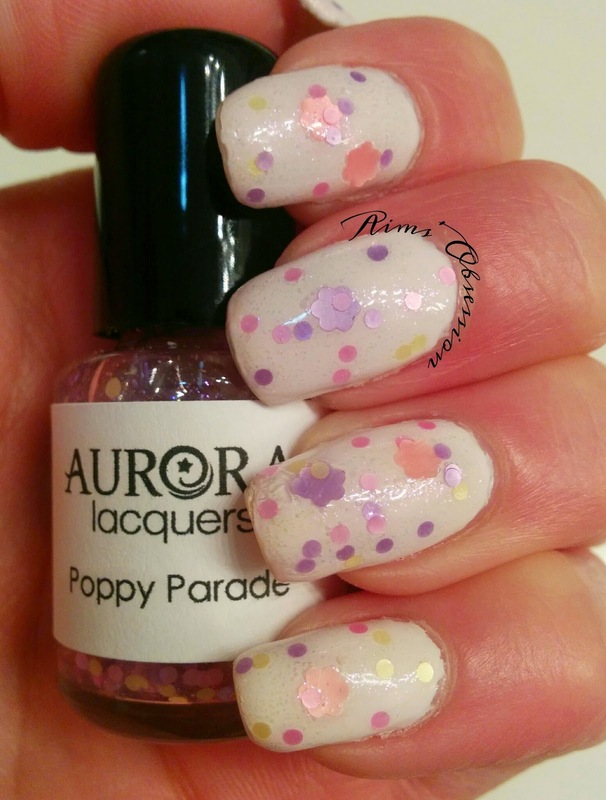 Poppy Parade is a really fun glitter topper that has a pink shimmer to it. 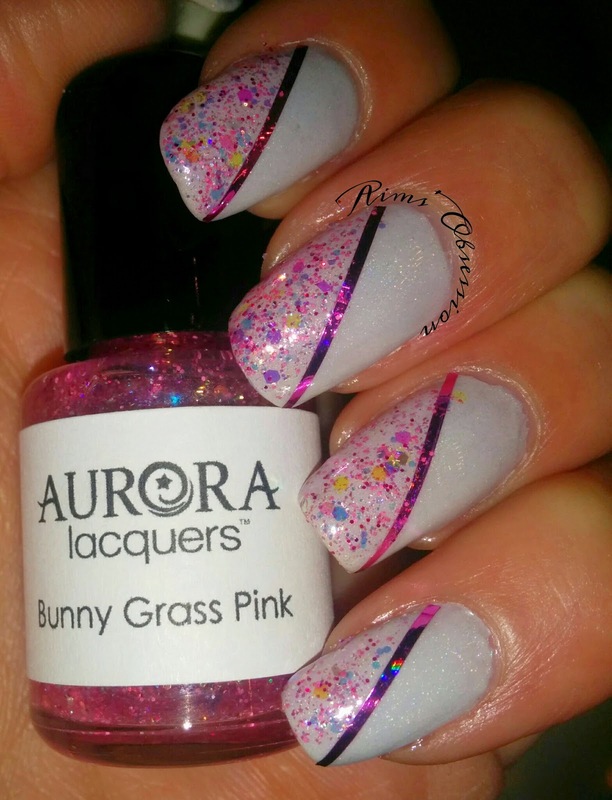 Glitters are pink and purple flower shaped and purple, pink and yellow tiny circle shapes. Fun all around! This is also a 5-Free polish. :) I topped Poppy Parade over My Fair Lily. 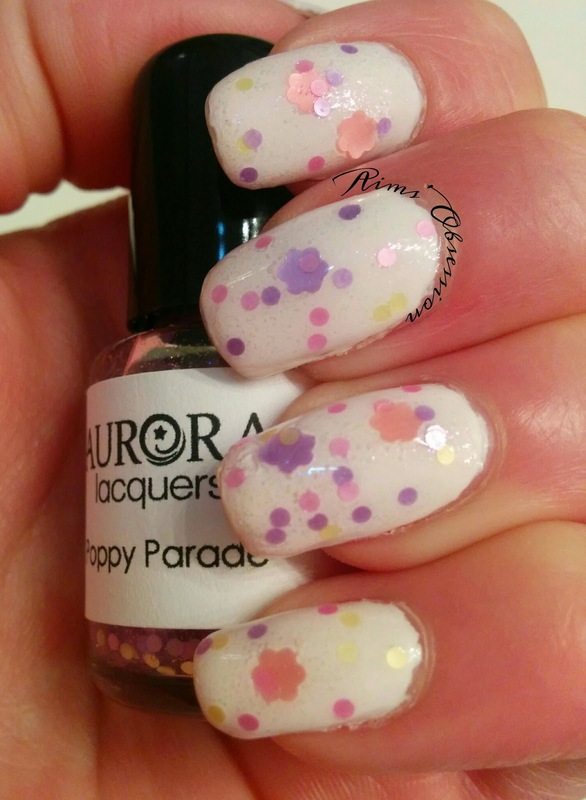 The shimmer in Poppy Parade was hard to capture with my camera but I was in awe of my fun nails the whole day I had this on! Application was . . . ok. I had no problem pulling base and shimmer out with the polish brush, but had to fish a bit for the glitters. I chalked part of it up to my using a mini bottle. 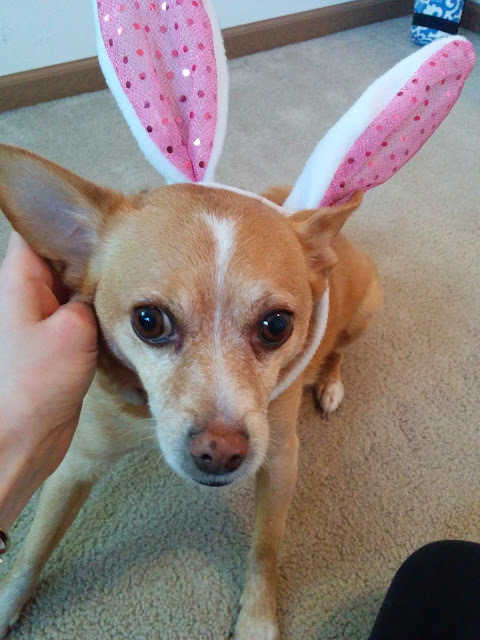 The end result was worth it though and I completely recommend adding this cutie to your collection! 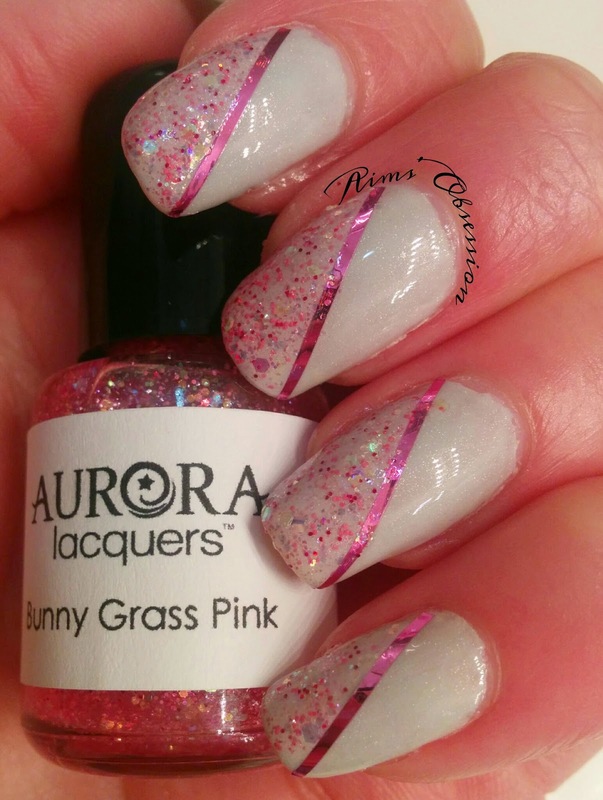 Bunny Grass Pink is one of my favorites from these 4 polishes! 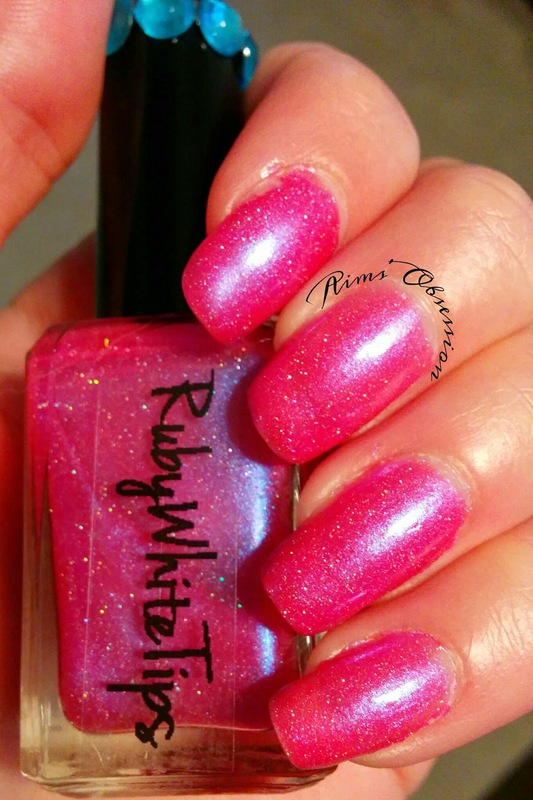 It is a LIMITED EDITION pink iridescent jelly glitter which is also 5-Free. So gorgeous! I fell in love right away! Application was amazing and only needed 1 coat of polish to achieve this look! 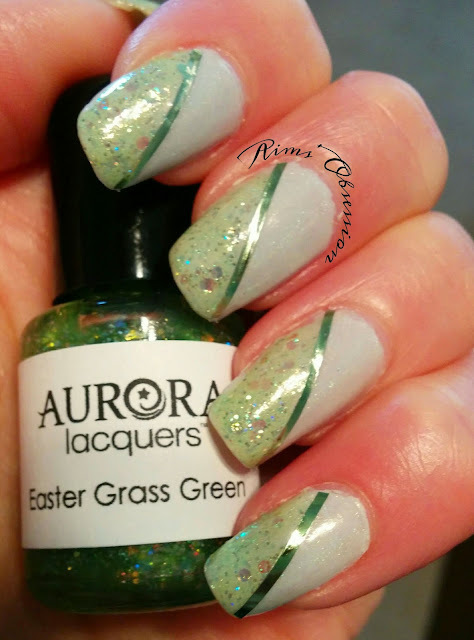 Easter Grass Green was another one of my favorites! 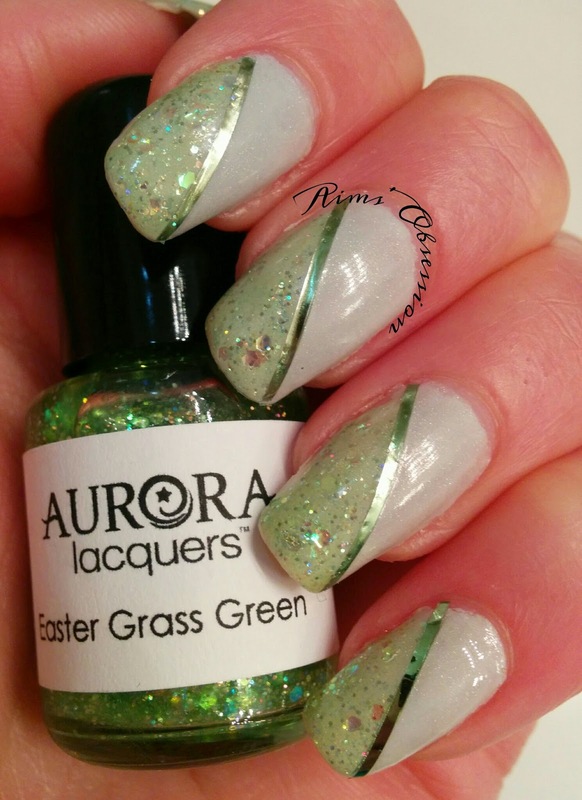 Easter Grass Green is a LIMITED EDITION lime green iridescent jelly glitter. 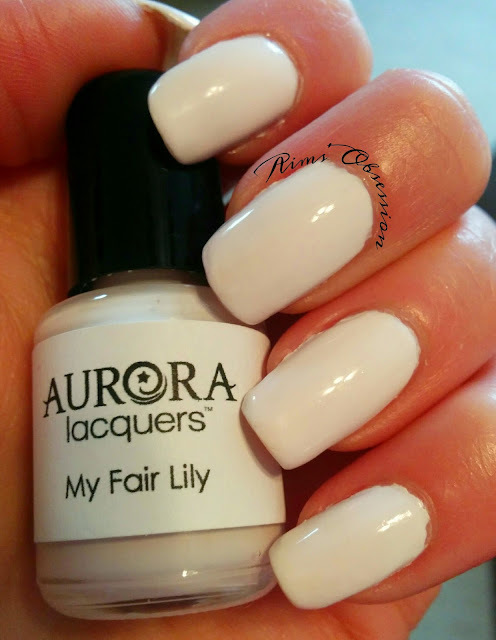 Like the other Aurora Lacquers polishes it is also 5-free! 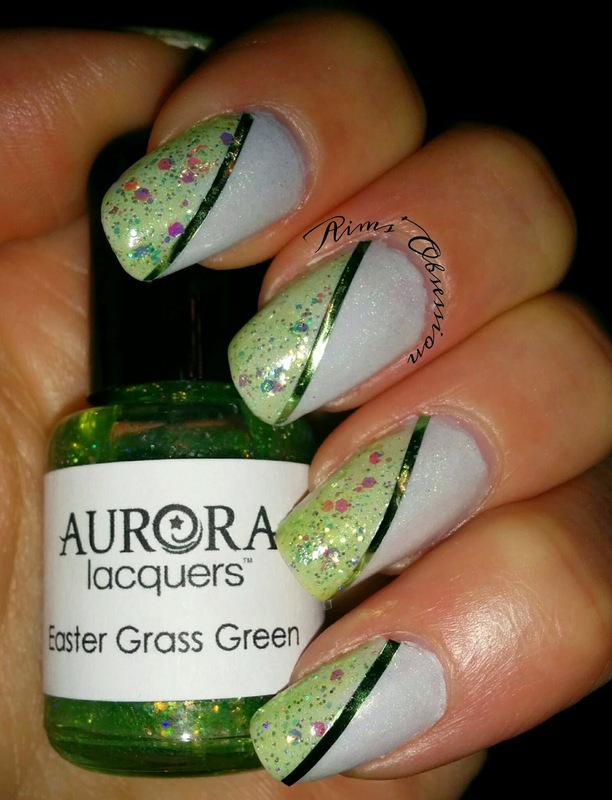 Easter Grass Green applied like a dream and I fell in love with it straight away. This is only 1 coat of polish! Dry time is great as well. I was very impressed with these 4 polishes and can't wait to see what else the mother/daughter combo at Aurora Lacquers has up their sleeves! 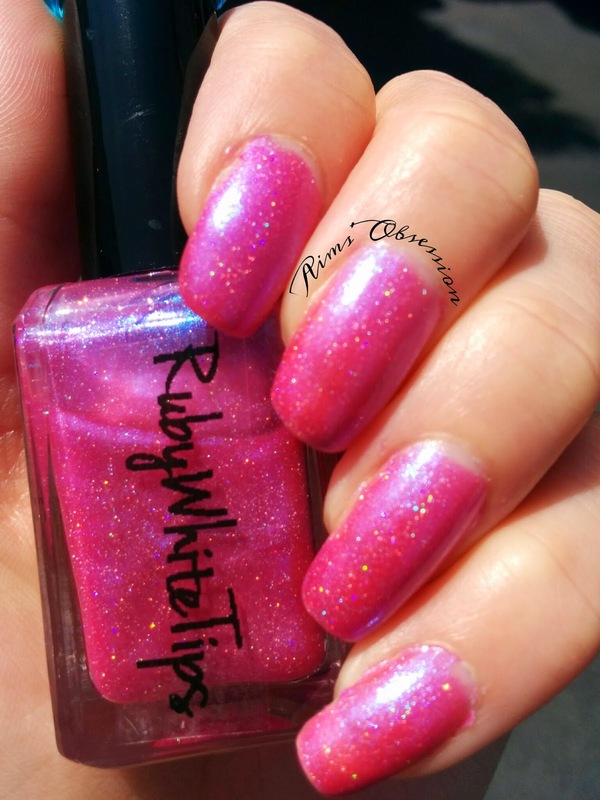 Check out some of their other amazing polishes on their online shop!